Turkish 8mm ammo was once widely available and usually very cheap. It still can be found, but it's not so common or cheap anymore. This is all corrosive Berdan primed on stripper clips. 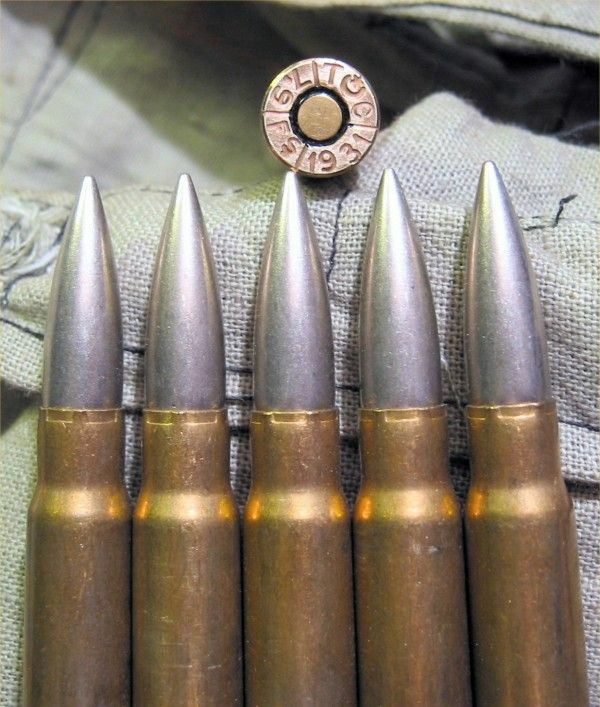 With a 154 grain jacketed bullet and flake powder this round duplicates the performance of the German 8mm S cartridge. This is a full power military cartridge that performs at the upper end of the pressure range for the cartridge. This is obvious when you shoot it. The Ottomans originally chambered their Mausers in 7.65x53 Mauser, but during WWI they started using more and more Imperial German weapons and ammo and eventually switched all their rifles to 8mm Mauser. 8mm Mauser is the American name for 7.92x57mm IS. Turkish barrels will be marked with the barrel dimension, usually 7.91 or 7.92. This is not the unfired bullet diameter, but rather the land to land dimension of the barrel. The bullet diameter is closer to 8.2mm (.323 inches) which will more closely match the groove to groove diameter. 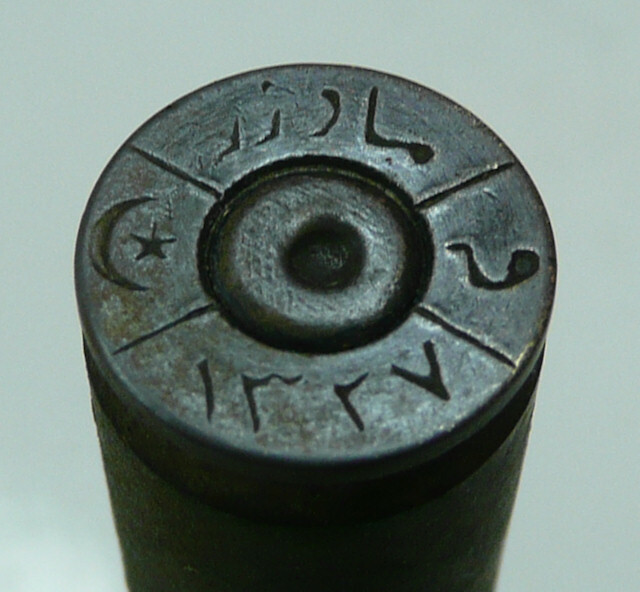 The earliest example of Turkish ammo that I have shot is dated 1936, although I have some 1931 dated ammo. These have cupro-nickel jacketed bullets. The Turks switched to copper or gilding metal jackets in 1949. 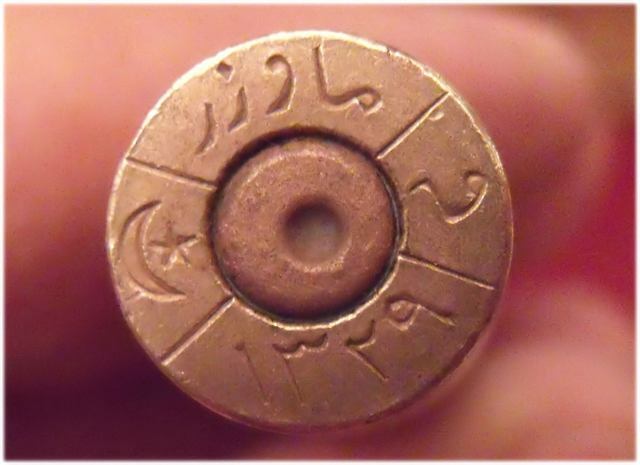 You will find that most Turkish ammo will attract a magnet which indicates that it isn't just lead in a copper jacket. For a page of tests of Turkish ammo, see this data from MHB and me. 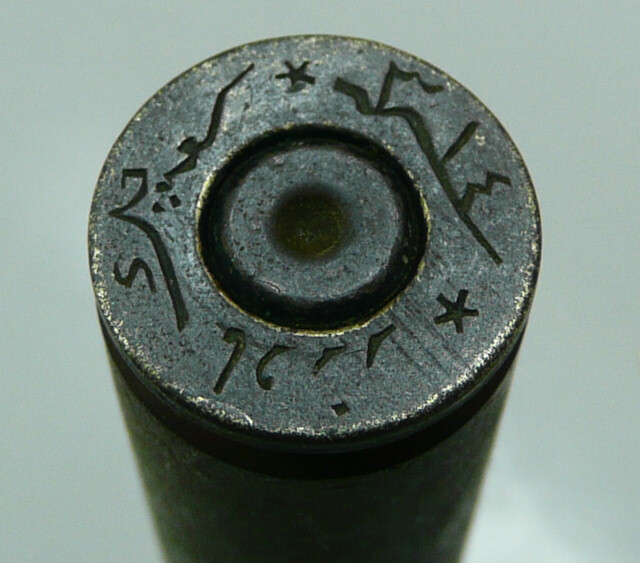 I want to thank DOGolden for these pictures of really early Turk 8mm Mauser ammo. The earliest is 1927 and is in arabic script. I got these two pictures from Toni in Greece and both are in arabic script. I don't see any year on the first one but the second one is marked 1327 wich would be about 1909. These are not 8mm. I got this next picture from Asaf who found it just north of Tel Aviv, Israel, "on a sandy hill that once was once a WW1 battlefield between the Ottoman empire and British forces." This is 7.65x53 Mauser. Not all Turkish ammunition is in good shape. Often you will find loose bullets, cracked necks and surface corrosion. You should closely inspect your rounds before firing. Some years seem to be worse than others. 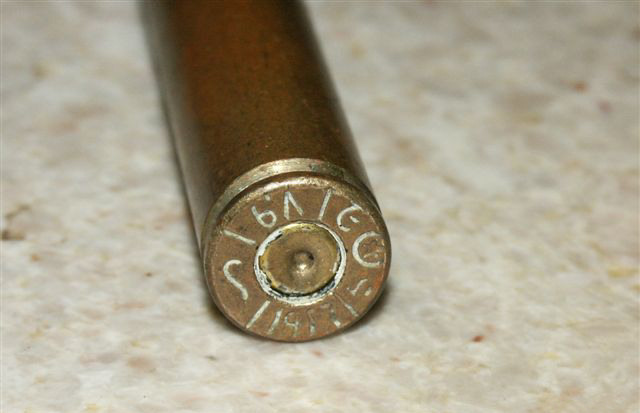 The WWII years seem to be the worst, but it isn't unusual to find signs of defective ammo from any year of manufacture. Often the discovery of significant amounts of defective ammo leads one to componentize the defective ammo, saving the powder and bullets for new loads. The German style powder, "Gewehr Blatchen Pulver", used from the 1890s through to WW II, was basically the same flake size throughout (2 x 2 x 0.4 millimeters); only the flame deterrent coatings changed to improve consistency. Similar powders were used in Austrian 8x50R, "S" type 8x56R, and the style of powder was also adopted by Turkey, Poland, Czechoslovakia, Bulgaria and basically anyone using "German" technology in the 1930s.